Those who reside in Maryland are influenced by and enjoy living near the Chesapeake Bay. Whether it be eating crabs (a favorite Maryland past time) or just out for a lazy boat ride, the Chesapeake Bay is a significant and enjoyable natural resource that we all should care deeply about protecting. Most of the state’s surface water run-off eventually finds its way into the Bay. This is a significant issue that affects this natural resource, with pollutants and erosion which can affect the aquatic plant life, fish, birds and more. Making an effort to minimize the surface run off, the legislature of Maryland passed the Storm Water Management Act (SWM) of 2007. This act increased the guidelines of how properties could retain and minimize the surface run off and how the water retention devices are to be managed to insure that they continue to work after they were created. According to the Harford County Government website, Harford County alone has over 1,000 structures that they inspect and monitor. Each county/jurisdiction in Maryland is responsible to oversee that the storm water management plans are followed. 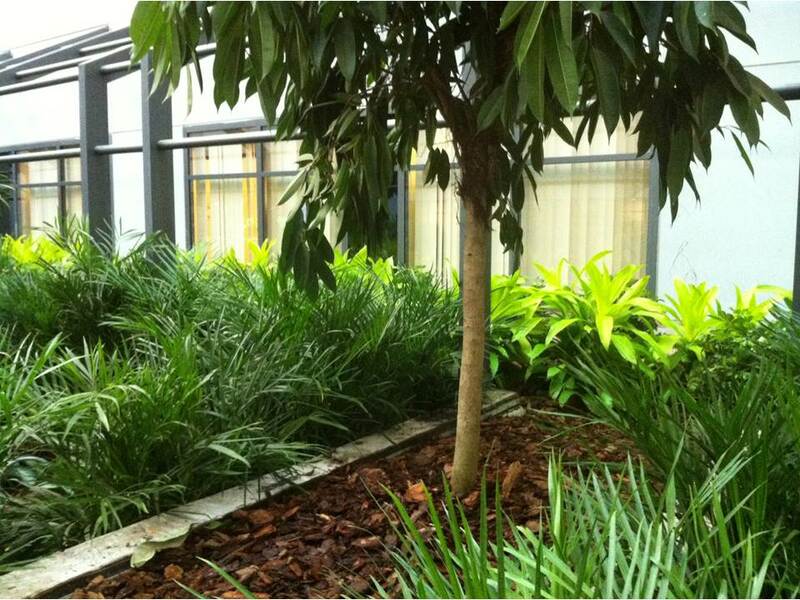 This results in routine inspections to make sure that your property is compliant. 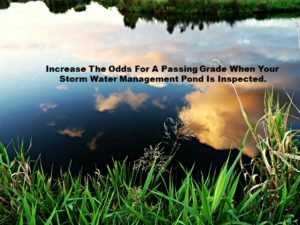 The owner of the property is accountable for storm water drainage and that means that they are required to maintain their Detention and Retention Ponds/basins. WHAT CAN HAPPEN WHEN MY SWMP IS NOT TAKEN CARE OF? Damage by erosion and unprotected run-off can be created on your property and neighboring properties if the water is not flowing the way that the system was designed to handle the flow. This, if ignored, can become a significant liability for the owner. Not to mention the increase in expense of repairing a bigger problem that would have been minor if dealt with sooner. Allowing sediment to build up and or large areas of erosion can mean additional work to dredge out the buildup as well as re-construction of the dams/banks. Periodic dredging is a part of routine maintenance. When ponds are not kept at the proper depth, they won’t retain the water that they are designed to hold making them ineffective. Ponds typically should be dredged approximately every 10 years depending on the amount of sediment and how quickly the sediment builds up. 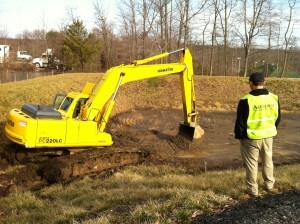 WHAT ARE INSPECTORS LOOKING AT REGARDING MY STORM WATER RETENTION? As mentioned earlier, each county sends out inspectors periodically to check on the storm water retention systems in their jurisdictions. Sometimes, they show up un-announced. When they arrive they will inspect your systems to make sure that there are no debris (sediment and or trash) building up or vegetation growing that blocks the water flow. They will look for areas of erosion around the basin and or banks both inside and outside of the structure among a few other items. WHAT CAN I DO TO ENCOURAGE A PASSING GRADE ON MY SWMP INSPECTION? Make sure that all inlets and outlets are clear of sediment, debris and vegetation that tends to build up and grow. Routinely checking on this a couple of times per year and addressing any needs will protect the investment of your retention system and help to insure a passing grade with the inspector(s). With wet soil comes specific plants such as phragmites and cattails that will eventually find their way to it and thrive in it. These tend to be extremely invasive and can take over your system quickly. These should be cut back as much as possible and a thorough cut back can be done in the winter months as well to help contain their spread. Pay attention for erosion around the inside and outside of all embankments and repair them before they become bigger. If you have any bare areas that should have grass growing on them, re-seed them immediately so that their root systems can establish. This will reduce the probability of areas that will “washout” or erode. Categories: Commercial and Industrial,Residential Communities.